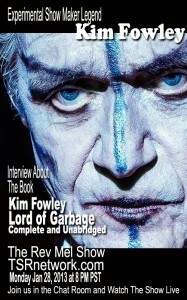 Live on the Rev Mel Show January 28, 2013 at 8 PM PST on TSRnetwork.com and TSRnetwork Youtube channel, icon legend Kim Fowley – the Experimental show maker – will be a guest on The Rev Mel Show to promote his new book Kim Fowley Lord of Garbage. Kim has worked in the music industry since 1959 – when he was hired to work with Alan Freed the King of Rock & Roll Radio. He has worked with such music artist such a Leon Russell, Kiss, Alice Cooper, The Runaways, Guns and Roses/Poison, VanHalen, Mother of Invention, The Byrds, Cat Stevens, Cheap Trick, Joan Jett and Iggy Pop just to name a few. Kim is a legend in the music industry and is a Songwriter Magazine Hall of Fame 2000. Kim has either produce, co-produced, Talent Spotter, Publisher, Written and has performed on stage and has made music and films with Snow Mercy and has been a trend setter for many years. His web site is http://kimfowley.com. So come in the chat room (on the right) on January 28th!